She’s no angel . . .
Can Dru survive long enough to find out who has betrayed her trust—and maybe even her heart? I freaking LOVED Strange Angels, so I was very excited to pick up Betrayals. I sped through reading this one, and I finished it within 24 hours of starting it! It was a great addition to the first one, although I didn’t like it as much as the first. 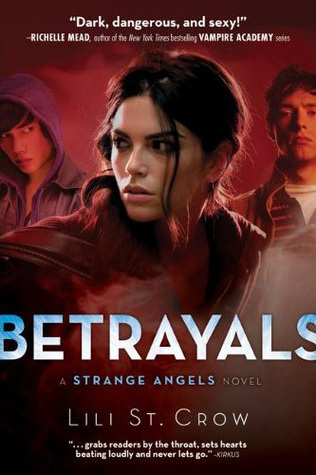 Betrayals picks up moments after Strange Angels left off, throwing us right back into the action and mayhem of Dru’s world. It’s almost like a bucket of cold water to the face. And Dru’s emotions are still so poignant and real, from the beginning. One of the things that I love is that Lili St. Crow keeps these things real. In almost every single novel I’ve ever read, the main characters can go days without doing necessary bodily functions—it’s not even a fleeting thought to them that, hey, their bladders might be bursting! But in these books, things are kept very grounded. The first thing that Dru does when she lands at the academy is pee. How’s that for real? I had a problem with Dru, though. In Strange Angels, she was a badass. Total, 100% badass. In Betrayals, she lost a lot of what made her tough. She relied more on other people to save her, and didn’t fight for herself as much as she did before. I’m hoping that in the next book, she regains what she lost, because Dru is one of my favorite YA heroines of all time, and it would be a shame if she lost her spark. Betrayals had me turning the pages, and sneaking it underneath my text books in school to finish it as quickly as I could. This series is quickly becoming one of my top favorites, and I’m eager to pick up the third novel, Jealousy, soon. I give this novel 4 out of 5 stars. Wow, great review! This series sounds like such a great series from your description--I just ordered the first 3 books after reading this review! :) Can't wait to read Strange Angels, and then Betrayals to see what I think about them. Thanks! I haven't read Strange Angels, but I've seen it everywhere. I think I've been deterred on all things angels as of late because the couple I read weren't that good (although I did like Angelfire). Maybe I'll give it a try. It seems that so many of the YA sequels just don't live up to the first. I'm still going to give it a go.